MULTIPLE FUNCTIONS - Computer desk, writing desk, sketchpad, board, dining table, flower Stand etc. The use of occasions: bed, sofa, table, carpet, meadow, desk etc. Object: adults, children and all the crowds. 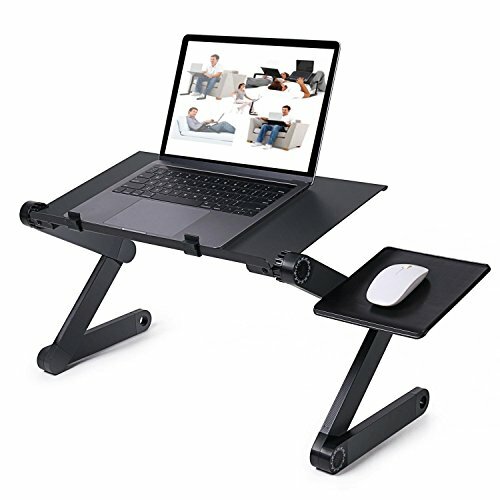 ERGINOMIC DESIGN - Featuring 360-degree rotation and the quality of being locked at any angle you need, this fully adjustable laptop stand can be folded flat for easy storage and enables you to use your computer at the most pleasing position, benefits your health and make you free from the neck ache and shoulder pain caused by poor posture. SUPERIOR DURABILITY - Light weight and could hold your computer securely at any angel as it adopts light and high-intensity aluminum tray with 2 anti-slip buckles and 6 robust adjustable ABS auto-locking joints. COOLING FUNCTION- With Ventilation Holes which provide air flow to dissipate the heat from bottom of your notebook. Not only a table but also a cooler. If you have any questions about this product by candiceli, contact us by completing and submitting the form below. If you are looking for a specif part number, please include it with your message.